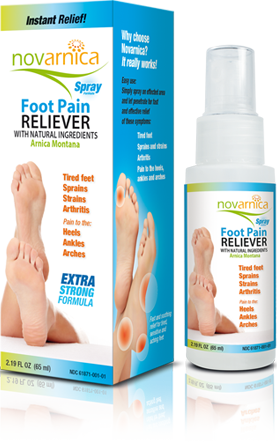 Authentic rejuvenation treatment for your feet, Novarnica foot care products effectively relieve common foot ailments. Spray solution, no rubbing, fast acting ! Every day, an active person can walk more than 8,000 steps. At the end of the day, your feet are tired and sore. It is time to pamper them with Novarnica! For quick and temporary relief of foot muscle and joint pain associated with arthritis, strains and sprains or tired and aching feet, tendon and ligament pain, bruises due to a fall or blow. Shake well before usage. For adults and children 13 years and older, apply Novarnica on affected area 3-4 times daily. Let penetrate through skin, no rubbing necessary. If pain persists or worsens more than seven days, discontinue use and consult a doctor. For external use only. Discontinue use if appearance of rash, irritation, reddening, dermatitis or eczema. Do not apply on wounds. Avoid contact with eyes and mucous membranes. Do not apply bandage or heat (heating pad) on the affected body part. Consult a healthcare practitioner prior to use if you are pregnant or breastfeeding. Do not inhale or swallow. Keep safely out of reach of children.